According to the Census Bureau, these counties are adding more residents than any other. Maricopa added more residents to its population in the 12 months ended July 1, 2006, than live in the city of Savannah, Georgia. 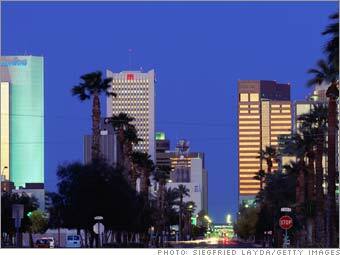 Its main city, Phoenix, has grown from a modest desert town into the sixth-largest city in the nation. Growth for the county as a whole has been explosive, from less than a million in 1970 to 3.8 million today. The population has increased by about 700,000 since 2000. Helping to drive growth is a diversified economy; many high-tech and telecoms companies have relocated to the area in the past few decades. And the climate attracts many seasonal visitors, adding to a strong tourism industry.